Sometimes “too many cooks in the kitchen” can literally mean the kitchen is too small for the cooks. When designing a small kitchen, a layout is important. The secret is understanding the dynamics of a kitchen’s workflow. Interior designers call it “activity zoning.” Where will each task be done and what does each part needs in terms of storage, shelving, drawers, and lights? But also when might it be used by people at different times of the day? These are all questions to ask to ensure a small kitchen is as functional as possible. 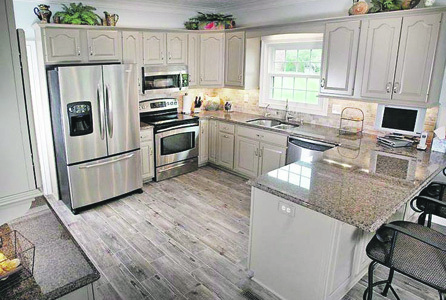 The best layout for a small kitchen is a galley style, which normally features two parallel walls with the kitchen benches, cabinets, and storage on either side. Keep clutter off the bench, a knife rack on the wall or in a drawer is a good idea. This means you don’t have any awkward corners to work with and gives you full access to all part of the kitchen. A one-wall kitchen is compact and space-saving but it can lack in bench space. Install a kitchen island trolley on wheels, it will provide the extra bench space needed for food prep and can be rolled away and stored when it’s not being used. Ideally, every centimeter of a small kitchen must be utilised to it’s full extent. Try taking overhead and full height cupboards all the way to the ceiling. Use the toe-kick space under the cupboards as storage for platters or trays and full extension internal drawers within cupboards maximise the quantity of storage. Shelving could be your key to keeping clutter off the bench. 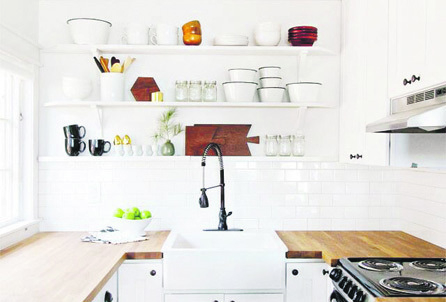 Even if it’s just a simple shelf or ledge on the wall, it’s the perfect spot for all those frequently used items that tend to hang around on the bench; oil, salt and pepper, tea canisters, herbs and spices. 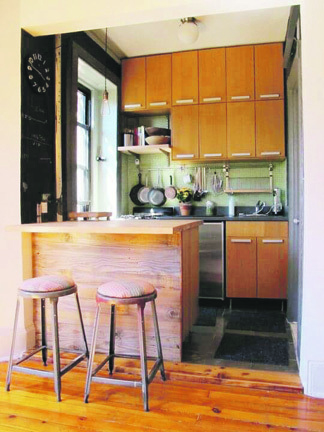 “Most would think to fill a small kitchen design with as much bench space as possible. This can be used for food prep and plating. Aso a good idea would be using a sink that has accessories such as a chopping board that can fit over top, or simply a sink cover to increase bench space. An induction stove is also a better option than a gas stove as it provides more flat surface that can be used as bench. Keeping bench space clear is vital when you don’t have much space to begin with. Build the microwave into the wall instead of having it sit on the bench. Incorporate a knife block into a cutlery drawer so there isn’t need for a knife block on the bench either. And while we’re tucking things away, it’s best to create an ‘appliance garage;’ a cupboard that houses the toaster, kettle, coffee machine and blender on the bench, but has doors to hide it away if need be. Lighter colors in a smaller kitchen will make the space feel bigger, but add some other texture and colour for personality and to prevent it from being too sterile. Light colours will make a space feel bigger and making your cabinetry and walls the same colour will create a visually larger space.